TFI conducts its Ninth Annual TFI Communications Technology Asset Valuation Conference and Pre-Conference Seminar: Technology Forecasting for Valuation in Austin, Texas. Larry Vanston is Conference/Seminar Director, with Ray Hodges and invited speakers and panelists also presenting (January 24-25, 2013). Sponsored by Technology Futures, Inc., Speakers include Dr. John H. Vanston, Larry Vanston and many others. Holiday Inn Town Lake, Austin, Texas (October 2-3, 2013). TFI conducts its Eighth Annual TFI Communications Technology Asset Valuation Conference and Pre-Conference Seminar: Technology Forecasting for Valuation in Austin, Texas. 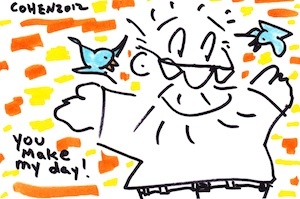 Mayan Happy Holidays from your friends at TFI! 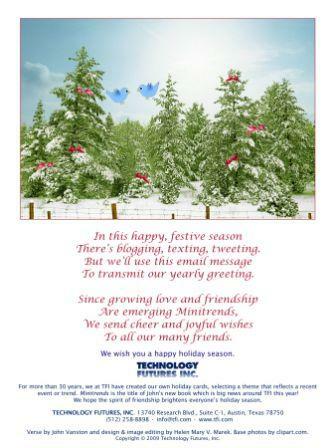 For 34 years, we at Technology Futures have created our own holiday cards, selecting a theme that reflects a recent event or trend. Dr. John Vanston, Chairman, writes the verse and Helen Mary V. Marek, VP Operations/Creative Director (and John’s daughter), designs the card. This year we chose the Mayan Calendar and TFI’s long forecasting experience as our subject. Hope you enjoy it and Happy Holidays and New Year! Sponsored by Technology Futures, Inc., Keynote Speakers, Dr. John H. Vanston, David Pearce Snyder, Futurist, Featured Speakers include Larry Vanston and many others. Omni Austin Hotel Downtown, Austin, Texas (October 17-18, 2012). John Vanston conducts Master Course: Weak Signals and Minitrends: Foundations for Truly Innovative Organizations" and speaks at the conference on "Succeeding in the Age of Imagination." Larry Vanston speaks on "Broadband Traffic Forecasts and the Implications for Different Access Technologies." The International Institute of Forecasters'32nd International Symposium on Forecasting, Boston, MA (June 25, 2012). Larry Vanston speaks on "Forecasting Technology Change and its Impact on Asset Lives." Institute for Professionals in Taxation 36th Annual Conference, Indian Wells, CA (June 24, 2012). John Vanston speaks on "MINITRENDS: How to Find & Profit From Emerging Trends"
Metropolitan Breakfast Club in Austin, Texas (May 2, 2012). John Vanston speaks on "MINITRENDS: How to Discover & Profit From Emerging Trends"
RISE Conference in Austin, Texas (March 27, 2012). TFI conducts its Seventh Annual TFI Asset Valuation Conference and Pre-Conference Seminar: Technology Forecasting for Valuation in Austin, Texas. Larry Vanston is Conference/Seminar Director, with Ray Hodges and invited panelists also presenting (January 18-20, 2012). Beyond 50 Radio interviews Dr. John Vanston and Carrie Vanston on how individuals can find and profit from Minitrends. "Minitrends: Finding and Profiting from Business & Technology Trends" (January 13, 2012). Happy Holidays from your friends at TFI! For 33 years, we at Technology Futures have created our own holiday cards, selecting a theme that reflects a recent event or trend. We hope you enjoy this year's card and wish you Happy Holidays and a Happy New Year! TFI's MINITRENDS book wins the Pinnacle Book Achievement Best Business Book Award. MINITRENDS has also recieved an Eric Hoffer Business Book of the Year Award and finalist nods from ForeWord Reviews’ Business Book of the Year, USA Book News’ Entrepreneurship & Small Business Book of the Year, and Dan Poytner’s Global eBook Awards Business Book of the Year. The book has also received excellent endorsements and testimonials. Larry Vanston speaks on "Set Top Boxes-Depreciation Forecasting ." FCIAAO 2011 TPP Seminar sponsored by the Florida Chapter of IAAO, Lake Mary, Florida (December 6, 2011). John Vanston speaks on "Minitrends: A Foundation For An Innovative Organization ." Austin-Silicon Hills Rotary Club in Austin, Texas (October 26, 2011). Larry Vanston speaks on "Life Cycle Analysis /Technology Forecasting ". The 24th 2011 Annual Conference and Training of The Society of Depreciation Professionals in Atlanta, Georgia (September 23, 2011). Larry Vanston speaks on "Telecommunications Issues and Values" with Jerry Weinert of AUS. New York State Assessors' Association 2011 Annual Meeting and Seminar in Buffalo, NY (September 13, 2011). Technology Futures, Inc. honored as a "2011 Greater Austin Business Awards Finalist"
John Vanston speaks on "Minitrends: A New Concept for Translating Emerging Trends into Promising Opportunities." Larry Vanston speaks on "Forecasts of Wireless vs. Wireline Broadband Access" and "What to Look for in a Good Forecast." The International Institute of Forecasters' 31st Annual International Symposium on Forecasting, Prague, Czech Republic (June 26-29, 2011). John Vanston speaks on "Mentoring/Coaching New Consultant: Individual or Team." IEEE Central Texas Consultants Network (June 15, 2011). John Vanston speaks on "Minitrends: Establishing an Innovation Exploitation Program." North Austin Rotary Club in Austin, Texas (June 6, 2012). RISE Conference in Austin, Texas (March 8, 2011). John Vanston speaks on "Initiating a Minitrend Exploitation Program." Creating High Performance Organizations for the New World Conference, Association of Strategic Planners in Dallas, Texas (February 28-March 2, 2011). TFI conducits Sixth Annual TFI Asset Valuation Conference and Pre-Conference Seminar: Technology Forecasting for Valuation in Austin, Texas. Larry Vanston is Conference/Seminar Director, with Ray Hodges and invited panelists also presenting (January 12-14, 2011). Happy New Year from your friends at TFI! For 32 years, we at Technology Futures have created our own holiday cards, selecting a theme that reflects a recent event or trend. We hope you enjoy this year's card and wish you a Happy New Year! Larry Vanston speaks on "Forecasting New Technologies in Telecommunications: Past Experience and Future Directions." INFORMS' Energizing the Future Conferencein Austin, Texas (November 7, 2010). John Vanston speaks on "MINITRENDS: Seizing the Future Before It's Defined." Wilco Entrepreneurs Community in Austin, Texas (October 14, 2011). Larry Vanston speaks on "Integration of Telecommunication Networks, Cable TV Networks and the Internet in the U.S.: Opportunities and Problems." Columbia University Continuing Education Program in New York, New York (October 8, 2010). John Vanston with Carrie Vanston presents series "MINITRENDS: Winning Big by Thinking Small." University of Texas in Austin SAGE Group (Seminars for Adult Growth and Enrichment) (Fall Session, 2010). John Vanston speaks on "Minitrends." IEEE Central Texas Consultants Network (September 22, 2010). TFI announces its Sixth Annual TFI Asset Valuation Conference and Pre-Conference Seminar: Technology Forecasting for Valuation in Austin, Texas. TFI conducts 3-day Technology Forecasting Seminar in Kazakhstan. Larry Vanston is Seminar Director. Sponsored by the U.S. Civilian Research & Development Foundation (CRDF) for the Kazakhstan's Innovation Research Fund, Astana, Kazakhstan (July 21-23, 2010). Larry Vanston speaks on "Telecom Forecasting for the 2010s". The International Institute of Forecasters' 30th Annual International Symposium on Forecasting in San Diego, California (June 20-23, 2010). John Vanston speaks on "Minitrends". West Point Society in Austin, Texas (May 12, 2010). Northwest Austin Rotary Club in Austin, Texas (April 23, 2010). Austin University Area Rotary Club in Austin, Texas (March 15, 2010). Audio of presentation. World Future Society in Austin, Texas (February 16, 2010). Web Analytics Wednesday in Austin, Texas (February 10, 2010). TFI conducts its Fifth Annual TFI Asset Valuation Conference< and Pre-Conference Seminar: Technology Forecasting for Valuation in Austin, Texas. Larry Vanston is Conference/Seminar Director, with John Vanston, Ray Hodges, and invited panelists also presenting (January 13-15, 2010). North Austin Rotary Club in Austin, Texas (January 4, 2010). Happy Holidays to all from TFI! 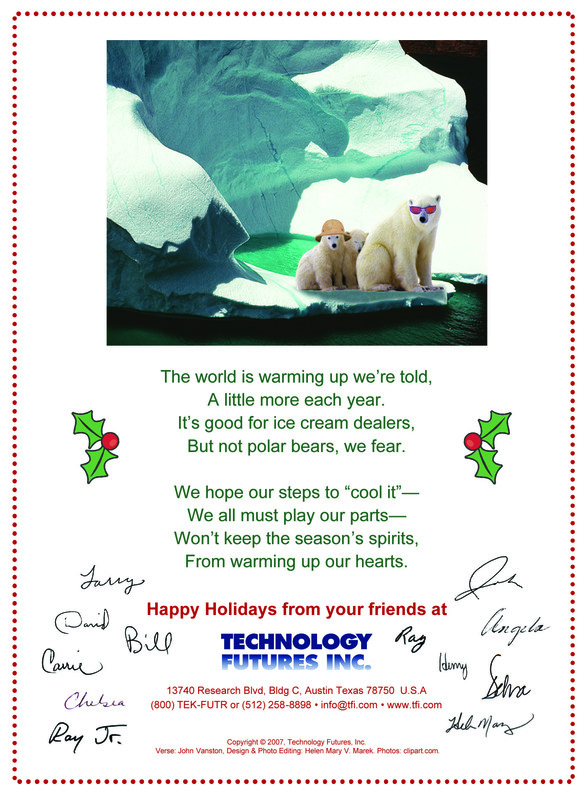 For more than 30 years, we at Technology Futures have created our own holiday cards, selecting a theme that reflects a recent event or trend. We hope you enjoy this year's card and wish you Happy Holidays! Larry Vanston speaks on "Hot Topics in Broadband and Telecommunications". The 23rd Annual Meeting of The Society of Depreciation Professionals in Albuquerque, New Mexico (October 5, 2009). Larry Vanston conducts one-day pre-conference on Convergence Within the Communications Industry—What Does It All Mean? IIR Telecoms Market Forecasting 2009 in London, England (September 28, 2009). Larry Vanston speaks on "Depreciation and Indexes: How do They ‘Factor’ In?" 39th Annual Wichita Program, Appraisal for Ad Valorem Taxation of Communications, Energy and Transportation Properties in Wichita, Kansas (July 28, 2009). TFI wireline access lines and broadband connections figure analyzed. "Your Broadband Customer Is Redefining Your Network," Organization for the Promotion and Advancement of Small Telecommunications Companies (May 26, 2009). Carrie Vanston talks to Chris Justice, Sparksight, about future trends in video. Larry Vanston quoted on telecom land line data figures. Saul Hansell, "Will the Phone Industry Need a Bailout, Too?" New York Times Bits (May 8, 2009). Larry Vanston comments on the economics of telecom land line data. Stacey Higginbotham, "A Dying Landline Business Sounds a Lot Like Static," Gigaom.com Blog (April 28, 2009). Larry Vanston speaks on "Technology Forecasting in the Telecommunications Industry." The National Academies' Committee on Forecasting Future Disruptive Technologies in Washington, D.C.(March 3-4, 2009). Henry Elliott speaks on "Mechatronics – Impacting and Changing Our Lives"
2009 Motor Drive and Automation Conference in Orlando, Florida (March 3, 2009). Larry Vanston writes feature article providing examples, philosophy, and practical advice for making quick forecasts. Lawrence K. Vanston, "Practical Tips for Forecasting New Technology Adoption" Telektronikk (February 2009). Larry Vanston and Ray Hodges provide overview of TFI's latest quantitative forecasts of the US telecommunications network in prestigious journal. Lawrence K. Vanston, Ray Hodges, "Technology Forecasts for US Telecommuncations Network" Telektronikk (February 2009). TFI conducts fourth annual seminar/conference series: "Technology Forecasting for Depreciation and Valuation," "Broadband Futures Seminar," and "Technology Futures Asset Valuation Conference" in Austin, Texas. Larry Vanston is Seminars/Conference Director, with John Vanston, Ray Hodges, and invited speakers and panelists also presenting (January 13-15, 2009). For 30 years, we at Technology Futures have created our own holiday cards, selecting a theme that reflects a recent event or trend. We hope you enjoy this year's card and wish you Happy Holidays! Larry Vanston's presentation at South Texas College’s 2nd Annual IT Symposium reviewed. Larry Vanston speaks on "Telecom Technology Convergence." South Texas College's Information Technology Forum 2008 in Mission, Texas (November 14, 2008). TFI announces publication of new market research report, Transforming the Local Exchange Network: Fourth Edition. Authored by Lawrence K. Vanston and Ray L. Hodges, and sponsored by the TTFG. Lawrence K. Vanston, Ph.D. (Seminars/Symposium Director). Also featuring John Vanston, Ph.D., Ray Hodges, and invited panelists to be announced (November 2008). Larry Vanston speaks on "Communications." The National Association of Property Tax Representatives--Transportation, Energy, & Communications Conference in Austin, Texas (October 28, 2008). Dallas Central Appraisal District's Management Retreat in Dallas, Texas (October 9, 2008). Larry Vanston speaks on "Technology Forecasting—The Essential Ingredients." The 22nd Annual Meeting of The Society of Depreciation Professionals in Greenville, South Carolina (September 23, 2008). TFI partners with E-Solutions Caribbean in conducting TFI's Telecom Trends Seminar. The Telecommunications Company Suriname in Suriname (August 18-19, 2008). John Vanston, and Larry Vanston discuss their forecasting experiences in feature story. Dan Sweeney, "The Words of the Prophets-Technology Forecasting," Juice: Alternate Fuels World (June 9, 2008). TFI IP telephony figures featured. Joe Vanden Plas, "Switch to Unified Communications Brings Major e-Discovery Headache, " WTN News (June 2, 2008). Henry Elliott, John Vanston, and James Irwin contribute article for special mechatronics issue of magazine. Henry E. Elliott, John H. Vanston, Ph.D., and James A. Irwin, "Mechatronics: Impacting and Changing Our Lives," e-Drive Magazine (April/May 2008). John Vanston speaks on "Nuclear Genie Gnawing at Stopper." Foreign Service Group in Austin, Texas (April 30, 2008). TFI announces new white paper examining societal implications of mechatronics. Henry E. Elliott, John H. Vanston, Ph.D., and James A. Irwin, Mechatronics: Getting Your Act Together (April 2008). TFI TV technology adoption graphs set the stage for chapter on digital technology and customized advertising. Claudio Marcus, The Reinvention of Television Advertising, Editor, Bobby J. Calder, Northwestern University's Kellogg School of Management, Kellogg on Advertising and Media, Wiley Pubs. (April 2008). TFI broadband households graph supports migration to faster broadband speeds. John N. Rose, "New Generation Networks, Convergence, the Long Tail, and the Universal Service Fund: Are We There Yet?" OPASTCO Advocate (published by Organization for the Promotion and Advancement of Small Telecom Companies) (March 2008). TFI report by Lawrence K. Vanston, Ph.D. and Ray L. Hodges, Depreciation Lives for New Fiber Optic Cable in the Local Exchange Network, receives media response. Calvin Azuri, "Report Recommends 20-25 years Life Cycle for Fiber Optic Cable," TMCNet (March 14, 2008). David Smith speaks on "The Future of Technology, Software, and Business Process—A Horizontal Convergence?" InnoTech Conference in San Antonio, Texas (March 6, 2008). Authored by Lawrence K. Vanston, Ph.D. and Ray L. Hodges and sponsored by the Telecommunications Technology Forecasting Group (TTFG) (January 2008). Larry Vanston presents webinar on "Rational Exuberance: Forecasts for Broadband Bandwidth Demand." The Fiber-to-the-Home Council's Industry Update Webinar Series (February 27, 2008). David Smith speaks on "Collaborative Technologies: If The Terrorists Can Do It, Why Can't We?" Austin SPIN and the IEEE Computer Society in Austin, Texas (February 20, 2008). David Smith describes present and future of "virtualization" as guest columnist. David Smith speaks on "Technology Infrastructure and the Future." Austin InfraGard Chapter in Austin, Texas (February 14, 2008). David Smith speaks on "Five Views of the Future." St. Edwards University Digital MBA Programs' Technology Evolution Class in Austin, Texas (February 11, 2008). TFI conducts third annual seminar/conference series: "Technology Forecasting Mini Seminar," "Broadband Futures Seminar," and "Technology Futures Asset Valuation Conference" in Austin, Texas. Larry Vanston is Seminars/Conference Director, with John Vanston, David Smith, Ray Hodges, and invited speakers and panelists also presenting (February 6-8, 2008). David Smith discusses growth of network management software. TFI's household broadband penetration figures support alliance providing solutions to cable companies. "Phoenix partners with Weintraub, Computer Business Review (January 21, 2008). David Smith speaks on "Jump to the Future." Bridge Point Elementary's Science Day 2008 in Austin, Texas (January 17th, 2008). David says it's one of the toughest presentations he's made! David Smith comments on Time Warner's "experimental" change in internet fees. TFI’s trend paper by David Smith, "TFI Provides Top 19 Technology Trends for 2008," receives excellent media attention. "TFI Rates Top 19 Technology Trends for 2008," BD Tech Daily, January 3, 2008). David Smith, "Technology Futures Identifies Its Top 19 Technology Trends for 2008," Wisconsin Technology News (December 27, 2007). David Smith, "The Top 19 Technology Trends for 2008," Manufacturing and Technology News (December 21, 2007). Many other publications and blogs including The Forcefield; The Digital ImageMaker; News.Bigg.Net, Mobile Toys, etc. Since 1978, we at Technology Futures have created our own holiday cards, selecting a theme that reflects a recent event or trend. We hope you enjoy this year's card and wish you Happy Holidays! TFI Ushers in the New Year with a Special Trend Paper. David Smith, "TFI Provides Top 19 Technology Trends for 2008" (December 26, 2007). David Smith discusses job opportunities in mechatronics. Larry Vanston, Ray Hodges, and David Smith author chapters in book. Lawrence K. Vanston, Ph.D. and Ray L. Hodges, Technology Forecasting for Telecommunications, David Smith, Strategic Roadmaps, Editor, Prabir Kumar Bandyopadhyay, Technology Management: Concepts and Applications, The Icfai University Press Pubs, Hyderabad, India. (December 2007). David Smith discusses fostering convergence technologies. Kate Harrington, "Central Texas Emerges as Crossover Technology Hub," Austin Business Journal (December 7, 2007). John Vanston speaks on "Nuclear Weapons Experiences." Central Texas West Point Society in Austin, Texas (December 5, 2007). Authored by Ray L. Hodges and Lawrence K. Vanston, Ph.D. and and sponsored by the Telecommunications Technology Forecasting Group (TTFG) (November 2008). David Smith looks at bundling from the consumer and industry view. Carolyn Shapiro, “V, Phone, Web, Wireless-Telecoms Want to Bundle it All for You,”The Virginia-Pilot (November 12, 2007). TFI announces its third annual seminars/conference series: Technology Forecasting Mini Seminar, Broadband Futures Seminar, and Technology Futures Asset Valuation Conference scheduled February 6-8, 2008. Lawrence K. Vanston, Ph.D. (Seminars/Symposium Director). Also featuring John Vanston, Ph.D., David Smith, Ray Hodges, and invited panelists to be announced. Courtyard Marriott Downtown, Austin, Texas. (October 2007). David Smith suggests Google needs a place like Austin to expand its transformation from a search engine company to one developing emerging technologies. Ben Philpott,“Internet Giant Google May be Setting Up Shop in Austin,” KUT Public Radio (October 19, 2007). David Smith discusses the future of technology and industry in Hungary. László Hofer,“Texan Businessman: The Challenge for Hungary is to Sell Its Intellectual Capital,” Hungarian News Agency (MTI) (October 19, 2007). InnoTech Conference in Austin, Texas (October 11, 2007). PDF of presentation. Ricardo C. Amaral, “The Smartest Thing China Could Do Right Now: Invest US$200 Billion in Brazil–Part 2,”Brazzil Magazine (October 5, 2007). TFI's report by Lawrence K. Vanston, Broadband Equipment Lives for Local Exchange Carriers, receives coverage from many blogs. FierceWireless, News.Bigg.Net, Broadband-High speed Internet, and Network Card Driver. IIR Telecoms Market Forecasting 2007 in London, England (September 27, 2007). Larry Vanston gives Keynote Speech on "Communications Convergence: Promises and Pitfalls Along the Way." Converging Technology Seminar sponsored by the Washington State Department of Revenue in Olympia, Washington (September 25, 2007). Larry Vanston speaks on "Broadband Convergence: Where We're Going and What it Means." The 21st Annual Meeting of The Society of Depreciation Professionals in Rapid City, South Dakota (September 24, 2007). TFI announces publication of its new report, Broadband Equipment Lives for Local Exchange Carriers. Authored by Lawrence K. Vanston, Ph.D. and sponsored by the Telecommunications Technology Forecasting Group (TTFG) (August 2007). David Smith speaks on "Future Trends, Technology, and Innovation: The Enablers for Transformation." Bootstrappers Network in Austin, Texas (August 13, 2007). Podcast of presentation. TFI introduces Future Innovations, a listing of articles about technologies impacting the future for those with a stake in forecasting and future-related areas. Future Innovations is also a supplement to TFI's free e-letter, Futures' Features. David Smith speaks on "Digital Convergence: What the Future Holds." 37th Annual Wichita Program, Appraisal for Ad Valorem Taxation of Communications, Energy, and Transportation Properties in Wichita, Kansas (July 31, 2007). John Vanston, Henry Elliot, and others author report, Mechatronics, A Technology Forecast. Sponsored by Texas State Technical College System (July 2007). David Smith speaks on "Technology Trends You Can't Ignore in Telecom." MTS Allstream CEO Forum in Toronto, Canada (May 24, 2007). David Smith discusses growth through acquisition trends. Richard Richtmyer, "Firm Goes Public: Brookside Looks to Purchase More Companies," Austin Business Journal (May 11, 2007). David Smith speaks on "Future Trends and Paradigm Shifts in Technology Transfer"
Masters of Technology Commercialization Program, IC2 Institute, The University of Texas at Austin in Austin, Texas (May 11, 2007). Larry Vanston speaks on "Technological Change and Convergence in Telecommunications." IAAO Councils and Sections Seminar sponsored by the International Association of Assessing Officers in Seattle, Washington (April 25, 2007). Larry Vanston discusses challenges to the local loop and network backbones from the acceleration of multimedia traffic. Henry Baird, "Implications of the New Worldwide Mobility," STC Lines (April 2007). TFI's broadband forecast graphs featured. Gary Kim, "Fatten Up: 100 Gbps Ethernet on the Way," ChannelVision (March-April 2007). David Smith writes about how strategic roadmapping helps organizations meet future market demands. David Smith, "Road to Victory," The Machinist (February 2007). David Smith discusses significant technology trends impacting the technology industry. "Earlier Daylight Savings Time Could Wreak Havoc on Electronic Devices," Biz Times Daily (Small Business Times) (February 28, 2007). Bill Kleinebecker discusses relationship between public’s growing appetite for high-definition video and rising broadband demand. Jon Van, "2007: The Year the Internet Crashes?" Austin American-Statesman (March 4, 2007). Jon Van, "Rapid Growth of Internet Use Pushing the Web to Its Limits," Dallas Morning News (Feburary 26, 2007). Jon Van, "Pipe Dreams: Who Will Unclog the Information Superhighway?" E-Commerce Times (February 24, 2007). Jon Van, "Pipe Dreams: Who Will Unclog the Information Superhighway?" Chicago Tribune (February 23, 2007). TFI conducts second annual seminar series: "Technology Forecasting Mini Seminar," "Broadband Futures Seminar," and "Impacts of Broadband on Asset Valuation Symposium" in Austin, Texas. Larry Vanston is Seminars/Symposium Director, with John Vanston, David Smith, Ray Hodges, and invited panelists also presenting (February 5-7, 2007). David Smith speaks on "Digital Convergence: A New Paradigm." The Annenberg Foundation’s TechSummit in Los Angeles, CA (February 2, 2007). TFI's report by Larry Vanston, Assessment of Wireless Broadband as a Competitor to Wireline Broadband, receives excellent response. Steven Titch, "Broadband Wireless Has Great Potential: Report," IT&T News (February 1, 2007). "Technology Futures Forecasts ILEC Narrowband Access Lines and Broadband Connections," STC Lines (January 2007). "Report Predicts Continued Rise Of Wireless Broadband," Telecom Trends (December 21, 2007). "New Telecom Report by Technology Futures, Inc." Global-CallCenter (December 20, 2006). David Smith's recent keynote presentation on the future of MEMS receives attention. Roger Allan, "Mass-Market Applications Accelerate MEMS Movement Into Mainstream," Electronic Design (January 19, 2007). David Smith discusses trend of collaboration among unrelated industries. Jon Van, "Medical Devices Child's Play," Chicago Tribune (January 14, 2007). David Smith, "Future Inclinations," The Machinist (January 2007). Larry Vanston quoted on the growth of IP video. "High-Speed Zone—This Week in Broadband Data," IP Capsule E-Newsletter (CED Magazine) (January 12, 2006). TFI’s trend paper by David Smith, "TFI Provides Top Technology Trends for 2007," receives excellent media attention. Giselle Greenwood, "Tech-Thousand-Seven?" Austin Business Journal (January 8, 2007). "Technology Futures Provides Technology Trends for 2007," EMSNow, January 3, 2007). "Tech Growth, Diversity Predicted for 2007," Austin American-Statesman (January 1, 2007). David Smith, "TFI Provides Top Technology Trends for 2007" (January 2007). Discover, Evaluate, Do Good! Find what trends are on the horizon and how you can find and profit from them in socially responsible ways.